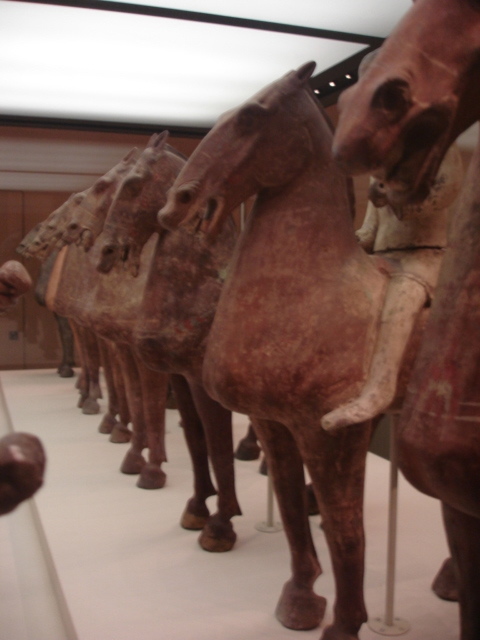 Western Han Dynasty (206 BC – AD 8) terracotta horses, photographed by author at National Museum of China, Beijing. LOUISVILLE, KY—Shaken and trembling Kentucky Derby winner I’ll Have Another, who came from behind and outside on the final turn to win the Kentucky Derby in a breathtaking display of speed and panic, is reportedly hoping that nothing like the 1-1/4-mile race ever happens to him again. Although it would end in victory and horror, the day started quietly enough for I’ll Have Another, with a brisk walk around Churchill Downs’ scenic paddock. But as the afternoon wore on, things became “extremely weird” for the young horse. Fran Jurga has a detailed article on PETA’s latest bid to help animals, and for once it looks like I might agree with them (I’ll spare you the laundry list of their more idiotic and downright offensive campaigns). In the run up to the Keeneland September Select Yearling Sales PETA released a video of two-year-olds breezing on the racetrack in time trials before they go into the auction ring. And breaking down. Hideously. I can’t watch the film – I’ve seen races where this has happened and I don’t need to see it on repeat. On the one hand, horses are, like humans, mortal and prone to accidents. On the other, they also need time to grow and develop bone without being hammered on a nasty surface at a young age. That tends to be bad for them, oddly enough. The relevant auctions took place in June. Now, in Europe there are group races for two-year-olds as early as June (the Coventry, Queen Mary, Albany, Chesham and Norfolk Stakes at Royal Ascot) and two-year-olds can even race against older horses in the Nunthorpe Stakes in August. All are run on true turf and contested by horses who are deemed precocious enough to compete. Presumably the youngsters who are breezed for auction are breezed because they are unraced, and perhaps are unraced because they’re not yet thought strong enough to do so? I’m confused about what’s going on here, but it’s clear that there needs to be some kind of screening process to ensure horses are physically ready for time trials and racing (again, I’m dumb, does this already happen? If not, then given the incredible level of veterinary medicine which surrounds horse racing, why not?). Perhaps too, as people have long been muttering, we need to selectively breed for qualities which will support that precocious speed, as Temple Grandin put it earlier this year. On Saturday Rosie will become the seventh woman to ride in the Kentucky Derby at Churchill Downs. Read more about her here and watch her in action. Take a ride on the brilliant racemare Zenyatta, who will try to win the twentieth race of a twenty race career tonight at Churchill Downs, Kentucky: the $5,000,000 Breeders’ Cup Classic. God but she’s shiney. Thanks to Karen Krizanovich for sending me this New York Times piece on the use of drugs in US horse racing in the run up to the Breeders’ Cup championship day. I’ve bolded for emphasis… I do not know how any true horseman or horsewoman could send injured horses into competition.